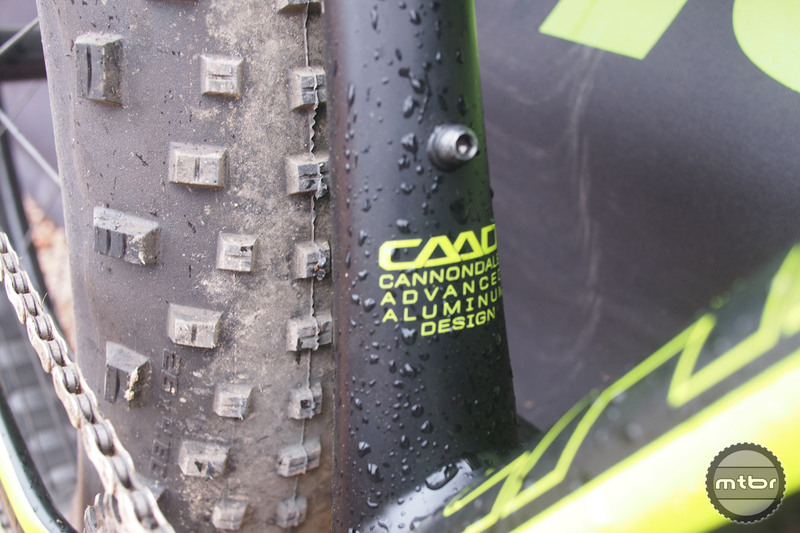 Cannondale brings their CAAD aluminum frame to fat bikes for 2016 (click to enlarge). Cannondale’s revered CAAD series of aluminum road bikes has been around since the CAAD 3 in 1997 (according to Wikipedia) and that model designation is still in use today with the CAAD12 series. 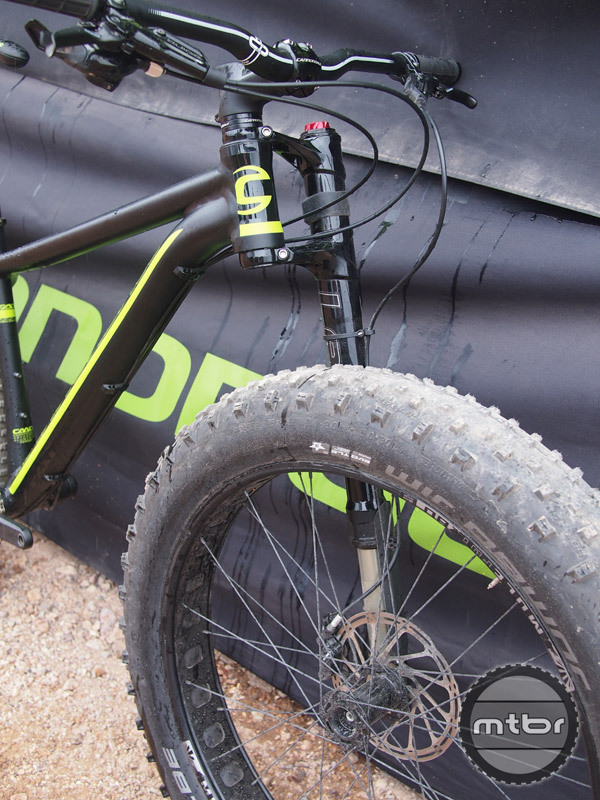 For 2016, Cannondale is bringing their CAAD heritage to the dirt side with the all new Fat CAAD fat bike. 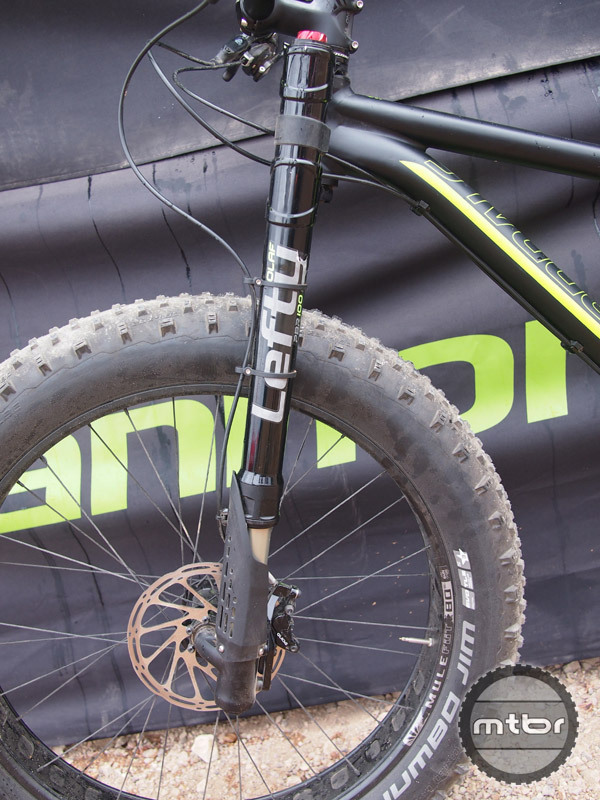 Olaf ’s wider clamps and inset axle offers the largest tire clearance of any fork. (click to enlarge). The CAAD series of road bikes has reached almost cult-like status for it’s ride qualities, durability and race-readiness. 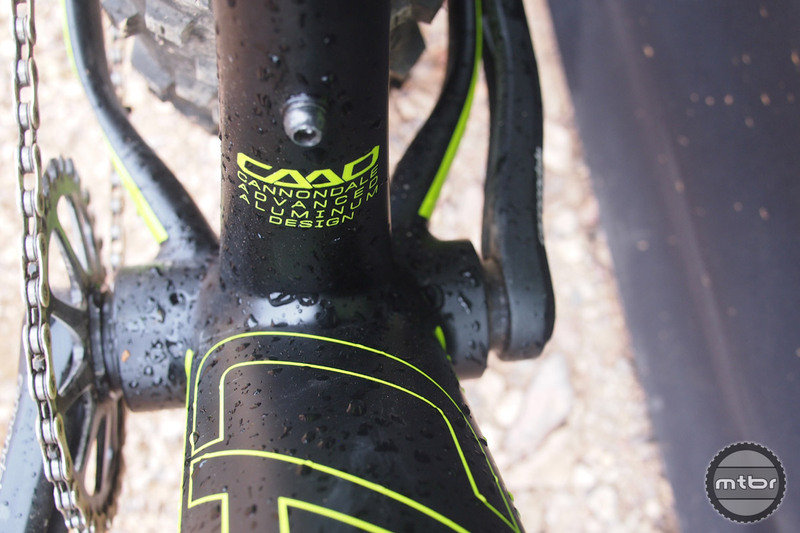 The Fat CAAD is no XC race bike, by any standards but it is interesting to see Cannondale bring their premium aluminum frame to this category. The geometry of the Fat CAAD is designed to keep the bike nimble and fun, even with fatties on and the short chainstays also help achieve this goal. The Lefty Olaf maintains the great tracking qualities of the standard size Lefty but also adds in a good bit of fork rake to keep things agile without resorting to steep head angles (which causes unwanted characteristics elsewhere). This means the Fat CAAD won’t handle like a plow even at low speeds. 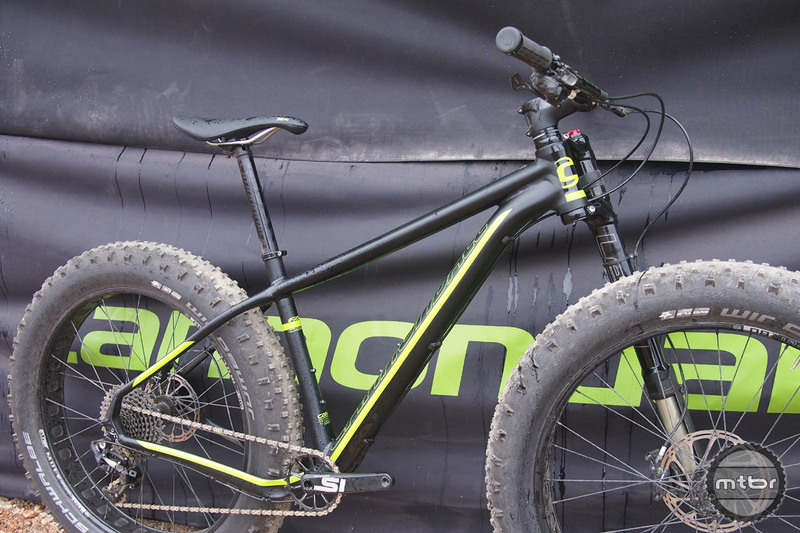 The Olaf has 100mm of travel, Cannondale’s PBR isolated damper technology and 60mm of offset. One of the key feautres of the Fat CAAD is the 120mm BB30XL bottom bracket that is Cannondale’s own spindle mated with their custom offset chainring(s) and the Si crankset allows them to move the crankarms further inward without sacrificing chain clearance. 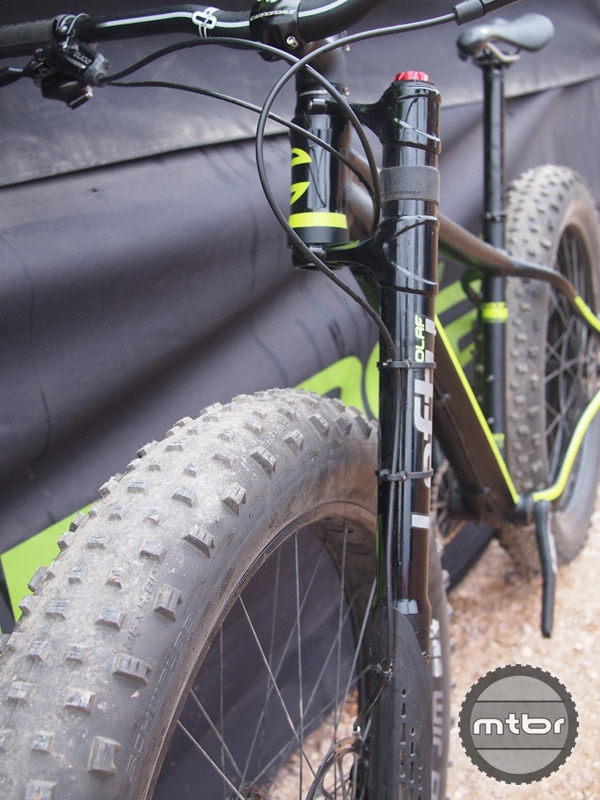 This creates a fat bike with the narrowest Q-factor on the market (198mm for 1x, 204mm for 2x) which provides a more natural stance and pedaling platform. Check out this highlight reel featuring the Fat CAAD ripping it up on both snow and dirt. The Fat CAAD 1 (shown above – black w/green highlights and Lefty Olaf) is spec’ed with SRAM’s X01 1×11 drivetrain, SRAM Guide disc brakes, Sun Ringle MuleFut rims, DT Swiss spokes and Schwalbe Jumbo Jim 26×4.8″ snakeskin tubeless tires. The Fat CAAD comes in five sizes (XS, SM, MD, LG, XL) and 2 models. The Fat CAAD 1 is the top-of-the-line with the Lefty Olaf and retails for $3730.00. 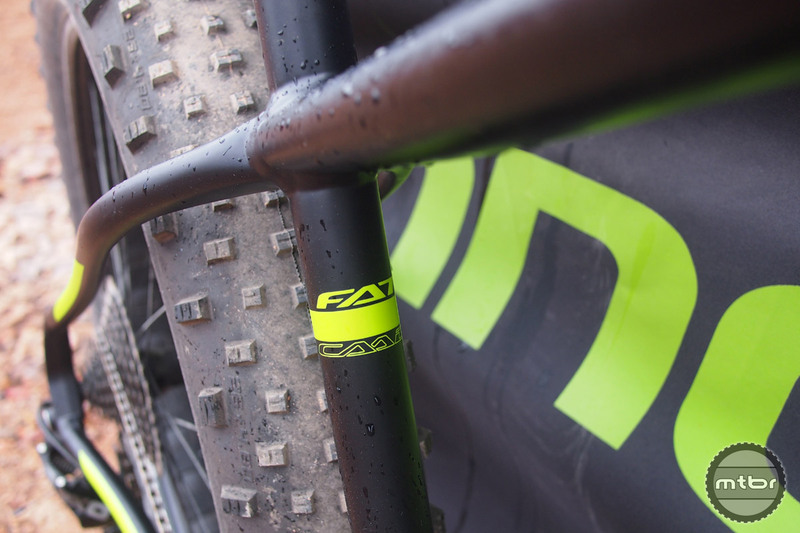 The Fat CAAD 2 (below) comes with a Fatty-Fat rigid fork and SRAM X5/X7 2×10 drivetrain with a retail price of $2130.00. Equipped with a Fatty-Fat rigid fork and SRAM 2×10 drivetrain, the Fat CAAD 2 is a less expensive option (click to enlarge). 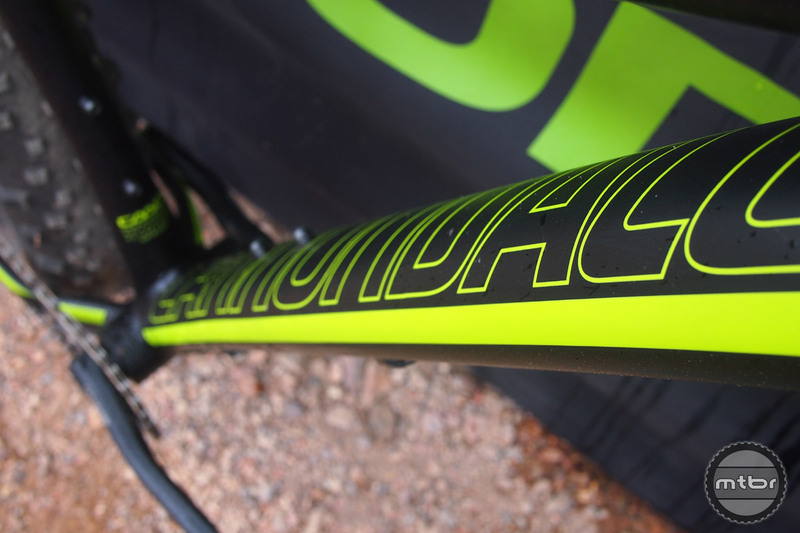 To learn more, visit www.cannondale.com. 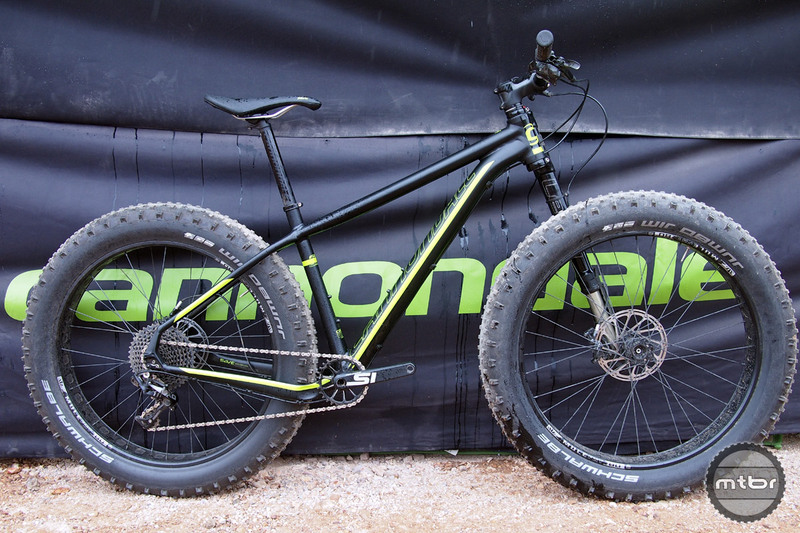 Cannondale brings their CAAD aluminum frame to fat bikes for 2016. 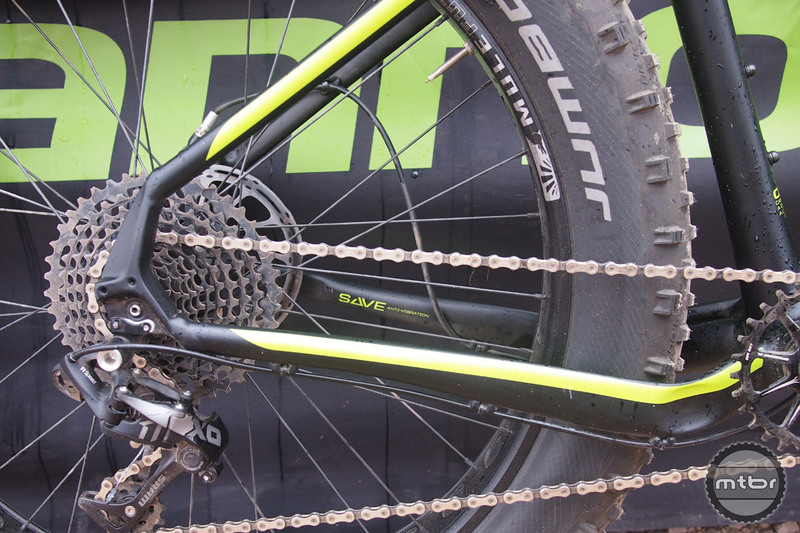 Olaf ’s wider clamps and inset axle offers the largest tire clearance of any fork. Lefty Olaf has 100mm of travel. Driveside view of the all new Fat CAAD. Wide down tube provides plenty of stiffness. 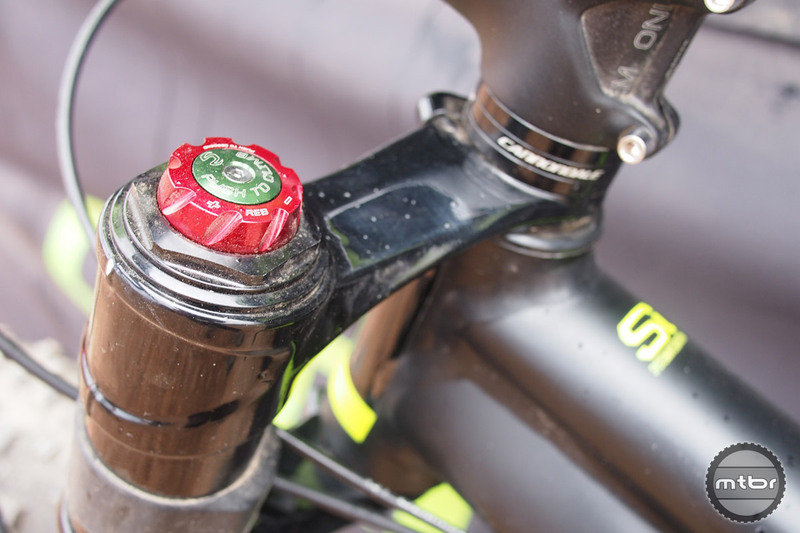 PBR Isolated Damper Technology with Enduro+ tune and updated controls. The Fat CAAD boasts a very low Q factor. 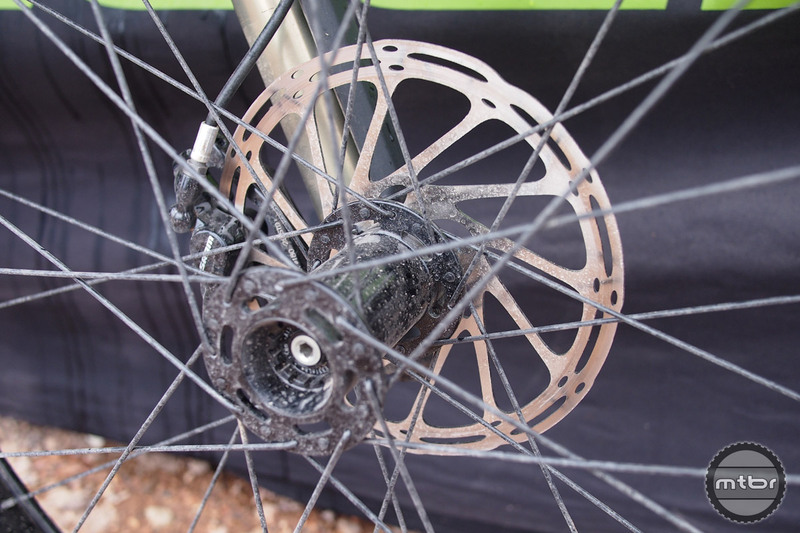 Lefty 73 front hub and SRAM Guide brake rotor. The Lefty Olaf features 60mm of fork offset to keep things manageable even at low speeds. 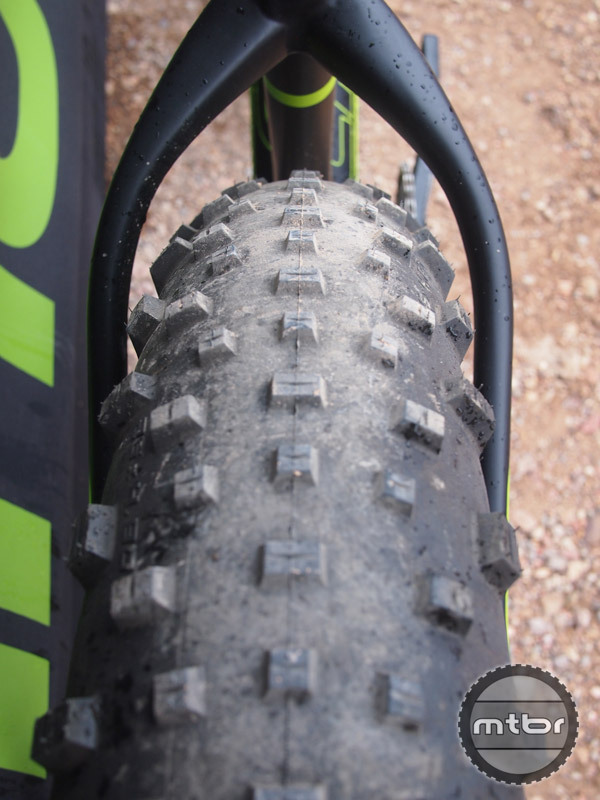 Plenty of tire clearance, shown with a 4.8″ Schwalbe Jumbo Jim. Equipped with a Fatty-Fat rigid fork and SRAM 2×10 drivetrain, the Fat CAAD 2 is a less expensive option. Hey Andy, it was filmed in St. George Utah and other southern Utah locations. wonder how slow they climb? (notice they omit that part) 🙂 kStill, fat bikes look like fun! Also, I know C-dale likes the Lefty, but I think this would have been a good application for a new Headshok type fork with 80mm travel. Then you wouldn’t have to mess with different axle standards or have another front wheel when changing forks. Have to tell ya, the pics of that bike look super cool. Really made me think hmmm, I’d love to have that bike. But did you notice how hard the (pro) riders appeared to be laboring everywhere??? They looked like they were struggling for pace and control! Pace and control? Fat bikes are about just going out and having fun. I’ve been riding a 40+++lb Motobecane for 2 years now and it is a blast. I can climb ragged steeps on that thing that I could only dream of climbing on my “race” bike. Down hills with tons of roots?? Don’t pick lines, just rip ’em. 20 miles of nasty singletrack WILL wear you out if you try to be fast. 30 miles of snowmobile trails will feel like a century on the road but it will keep you off the trainer in the winter here in the northeast. 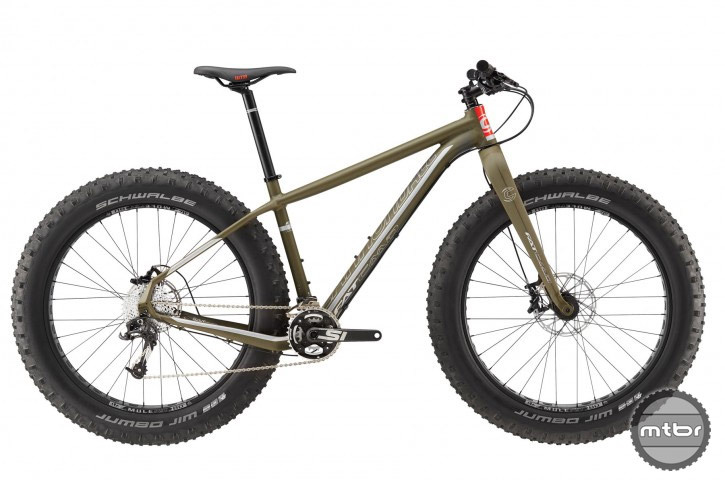 Fat bikes are fun and I may just grab one of these Fat Caads for my birthday.